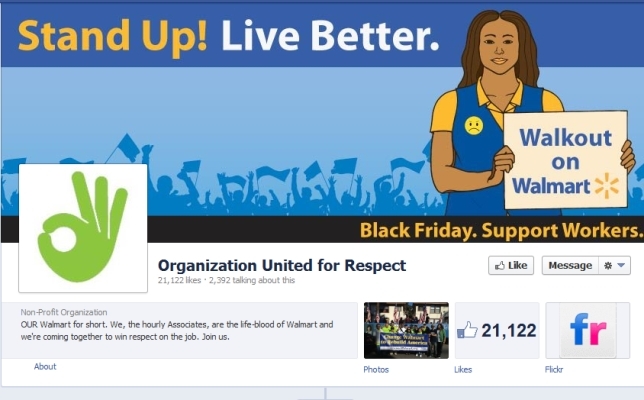 On Black Friday, Nov. 23, 2012, known as one of the busiest days for U.S. retailers, more than 500 Walmart workers took an incredible risk and walked off their jobs to strike against the company’s retaliation against workers who’ve spoken out about the need for better pay and treatment. It was the first time in Walmart’s 50-year history that workers at multiple stores walked off the job, amidst threats and intimidation, to stand for what they believed in. And it wasn’t just employees. 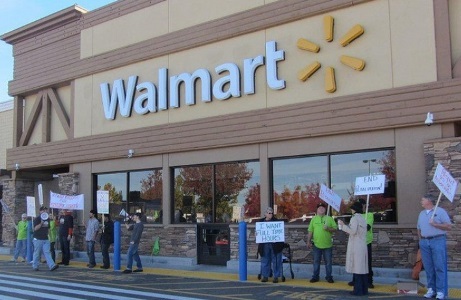 Tens of thousands of community supporters joined Walmart associates on the picket lines with actions taking place at more than 1,100 Walmart locations across the country. To say the media took notice is an understatement. More than 24,000 articles have been written about Walmart workers’ protests, from the front page of small-town papers to the New York Times. A movement was born, or more aptly it became visible. What had been building strength in the shadows for more than a year is Organization United for Respect (OUR), known as OUR Walmart, a grassroots network of, by and for Walmart Associates that is supported by United Food and Commercial Workers (UFCW). This is a story about UFCW being bold enough to experiment with new tactics, and how OUR Walmart is using the power of online and offline mobilisation to make real change at the world’s largest private employer. As the Corporate Action Network (CAN) notes, multinational corporations have become so large, complex, and powerful that traditional methods of holding them to account often fall short. That’s certainly what UFCW has been finding in its nearly two decades-long fight to make Walmart respect worker’s rights to organize. Andrea Dehlendorf, UFCW assistant director of the Making Change at Walmart campaign, says the main source of the problem is outdated labor laws that were conceived in the 1930s, long before the rise of the global corporation. As a result, current labor laws make it easy for Walmart to aggressively retaliate against the threat of unions without penalty. For example, in 2005, after Walmart workers in Jonquiere, Quebec, used the Canadian labor process to win the right to unionize (if enough staff sign in favor a union can be created without consulting management), the company retaliated by closing the store completely, leaving 190 people unemployed. In Texas, 2000, Walmart closed its meat department after 11 meat cutters voted to join a union. And despite these attempts of workers to organize, Walmart hasn’t budged on its employee practices, paying some of the lowest wages possible for retail workers, and changing its predominantly part-time staff members’ schedules every two weeks, which makes it impossible for workers to find other part time jobs or plan ahead. Walmart also heavily influences employee standards throughout the U.S. In These Times journalist David Moberg writes that over the past few decades, Walmart’s competitive power — a combination of size, technology and cut-throat personnel policies — has played a role in dramatically reducing American retail workers’ average income and unionization level (from 8.6 percent in 1983 to 4.9 percent in 2011). “It’s very clear that pursuing a traditional union strategy was not going to work and in order to really address the issues and concerns that workers were raising a non-traditional route was needed,” recalls Andrea. OUR Walmart was born from a comprehensive process undertaken at UFCW involving union stakeholders, outside experts and Walmart associates to share their perspectives and explore strategic possibilities that could get Walmart to change how it treats its workers. Walmart workers, UFCW and other community leaders also rigorously explored historical lessons, and other successful social change movements that might offer clues to winning against Walmart. The process resulted in a fundamental shift in strategy. 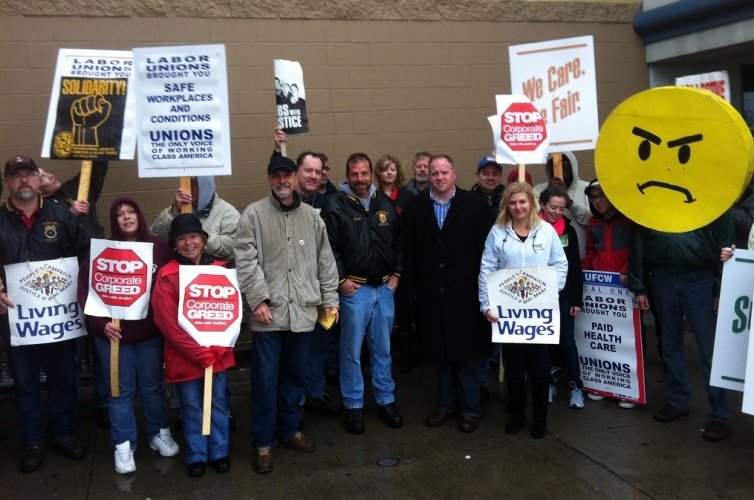 The campaign to allow Walmart workers to organize would no longer be a UFCW campaign that included a worker component. Rather, the Making Change at Walmart campaign was designed to put Walmart workers in the driver’s seat, using direct action to advocate not for a union, but for better pay, benefits and more respect at work. Angela Williamson had been Google searching for something like OUR Walmart ever since she slipped a complaint note under her manager’s door at the Florida Walmart where she worked. Angela wanted her manager to know that she felt it was unfair for her colleagues to be written up about production issues despite the store cutting staff and hours, which left the remaining employees overworked and scrambling to complete additional duties.While Angela felt it was her duty to stand up for her co-workers, she also felt a little scared at possible retaliation or disregard from management. That’s when Angela’s Google search uncovered OUR Walmart, a nationwide network of hourly associates taking a stand against the retail giant by using their collective power to advocate for better companywide practices. Angela joined OUR Walmart: “I know there is power in numbers so that’s why I joined them,” she says. The Making Change at Walmart campaign identified early on the need to be active in the spaces where Walmart associates already were — the Web and Facebook. But they knew they couldn’t just create an OUR Walmart website and corresponding Facebook page to reach hundreds of thousands of Walmart employees they were vying to attract. They would need to be active online, social media, and offer ways to connect Walmart associates in ways that built relationships and trust, leading to offline action. OUR Walmart hired online organizer Eric Schlein whose role was to establish the network’s Facebook presence and work to encourage real-world action among supporters. The team has since expanded to three, the other two being former Walmart associates fired from Walmart including Angela, to accommodate the page’s tremendous growth. In a little over a year, OUR Walmart’s Facebook engagement has ballooned from 2,000 likes to more than 20,000, and at times has had 7,000 people talking about the page. Of the 20,000 fans, nearly 70 per cent are Walmart associates. According to Eric, the key strategy behind Our Walmart’s Facebook page is creating what they call a community of care. The Facebook page is a place where associates can connect and empathize with each other’s stories, gaining a strong sense that they’re not alone. An important element of creating a community of care is building private Facebook groups. The groups are broken down mostly by geography, for example Central Florida Walmart associates group, with the online organizers exploring other ways to bring people together. Eric says it’s in these groups people who are fearful of speaking out on the public page can connect with their colleagues in a private, intimate setting. OUR Walmart worked with the Engage Network, which specializes in online to offline action, to develop its strategy, and keep the Facebook groups small, which research shows is key to offline mobilisation. According to Eric the online organizing effort and the community of care paid off by strengthening the resolve of workers to strike on Black Friday. “We knew those workers struck at a much higher rate than those who weren’t connected online,” he says. Another key component to increasing OUR Walmart’s online presence is its For Respect app, developed in-house. The app, available on the OUR Walmart website, allows Walmart employees and supporters to reach out to their Facebook friends who work or have worked at Walmart and let them know about the grassroots network of associates fighting for change. The app invites Walmart workers to join OUR Walmart. The technology was instrumental in expanding OUR Walmart’s membership quickly with 1,500 people using the app. Last year, the OUR Walmart website was the third largest recruiter of new Walmart associates following major on-the ground organizing efforts. Prior to the Making Change at Walmart campaign, when a Walmart worker was fired (often for what they say was advocating for their and colleagues’ rights), it was the end of the story. The OUR Walmart strategy knew they needed to get these workers to fight back. Currently, 30 Walmart associates volunteer for OUR Walmart, responding to a number of OUR Walmart outreach options their colleagues can use when looking for support: an OUR Walmart 1-800 number, general e-mail, text and Facebook. The outreach process offers a ladder of engagement for new members: the volunteer listens to the associate’s challenge, and offers potential solutions and actions. 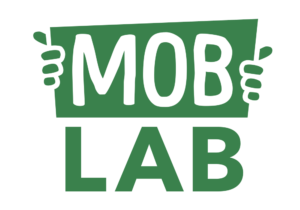 Next, the volunteer offers to provide training so they can advocate on their own with a goal of having the associate start reaching out to others, actively engaging and connecting new coworkers to the campaign. An example of this engagement ladder in action is Angela’s story. When she was fired from Walmart she posted the news in her private OUR Walmart Facebook group. Within an hour an organizer was calling to learn more about the event and when the call ended the two had created a plan of action. Angela joined OUR Walmart’s volunteer network and took part in a traveling roadshow that hit nine states in two weeks. The group visited Walmart stores at night speaking with workers and screening a video featuring frustrated workers from across the country. As a volunteer organizer, Angela would take associates names and add them to her Facebook. She’d also invite them to join private OUR Walmart Facebook groups. The offline to online was needed to help associates find their voice. “In some stores you’ll only have a couple of people who are willing to speak out at first, if any. Once you bring them online and they can look at the Facebook page and see all of these postings of several hundred different people posting about pay, cut hours, unfair treatment. It tends to give them a voice and eventually they do become active,” she says. “It’s not me that’s signing up a member, it’s usually because a worker online has reached out, and pulled them into these groups – they’re organizing themselves,” says Angela. OUR Walmart was able to turn out hundreds of community members in support of Black Friday by focusing on alliance-building and partnerships, more than 30 of them, with organizations as diverse as Occupy, faith groups, unions, even artists. SumOfUs, a global movement advocating for a better global economy, says they were already intrigued by the OUR Walmart campaign before the association reached out for support. When OURWalmart did, SumofUs responded with full force. 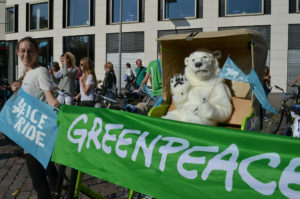 “We thought it was a compelling campaign, and the whole team was putting work into it for two months,” recalls Rob Wohl, a SumOfUs campaigner. He says the global network had to examine where it could have its biggest impact. While traditionally SumOfUs uses its 850,000 global membership heft to garner myriad petition signatures, they knew that approach wouldn’t be enough to shift Walmart. (They did collect 100k signatures asking Walmart to negotiate with warehouse workers). The decision was made that SumofUS could raise funds to support striking workers. They built a strategy to engage its membership in the issues facing Walmart workers and ask them to contribute to the strike fund. It’s the most successful campaign SumofUS has ever run, raising more than $75,000 in small donations from 5,000 of its members. Because public pressure is preventing Walmart from firing striking workers, the funds were instead used to hire former associates to the OUR Walmart campaign. Rob credits the successful collaboration with OUR Walmart to having been given a good amount of lead time, clearly defined roles, and open, responsive teams and collaboration among the groups. Alliance building with SumOfUS was and other organizations enabled Our Walmart to share its message and significantly increase the projected field turnout for Black Friday. An alliance with the Corporate Action Network enabled several areas to strike without staff support, making history. Online volunteer leader Michael Ahles turned out four workers, with three striking, and 200 community members with very little staff support using the Corporate Action Network and Facebook (creating a Facebook event). According to Eric, in the lead-up to Black Friday, it felt like the entire progressive movement was supporting OUR Walmart. A number of store level victories have occurred as a result of OUR Walmart, from providing a chair for door greeters to floor mats for cashiers and floor buffers for cleaning staff. But perhaps the largest changes are yet to come. On Jan. 15, 2013, Walmart U.S. president and CEO Bill Simon delivered a keynote address at the National Retail Federation’s annual convention. In his speech, he noted that Walmart has heard from its workers that they’d like more full-time positions, and an easier process to achieve them. Bill announced that Walmart is working on internal changes to make sure part-time associates have full visibility into full-time job openings in their stores and nearby stores— and that they always have the first shot at those jobs. “We will also bring more transparency to our scheduling system so part-time workers can choose more hours for themselves,” he announced. These changes speak directly to OUR Walmart’s Declaration for Respect. The Making Change campaign at Walmart continues.